After Lydia died so many of us were devastated. Yet, unbeknownst to us our sweet girl had many surprises in mind as she left her artwork, drawings and pictures for her family after she passed. She had them in her room in a little pile on her table, right next to her markers and crayons. Upon seeing them, I was speechless. What a priceless gift she had left everyone, the perfect medicine for a broken heart. Lydia had pictures drawn for nearly every person close to her. She had written their names on their paper and drawings of each of them: Grandma, Nana, Papa, Daddy, Mom, Brother, Cousins, and more! The drawings were composed of vibrant colors, people, hearts, flowers, sparkles and everything you could imagine. So beautiful. 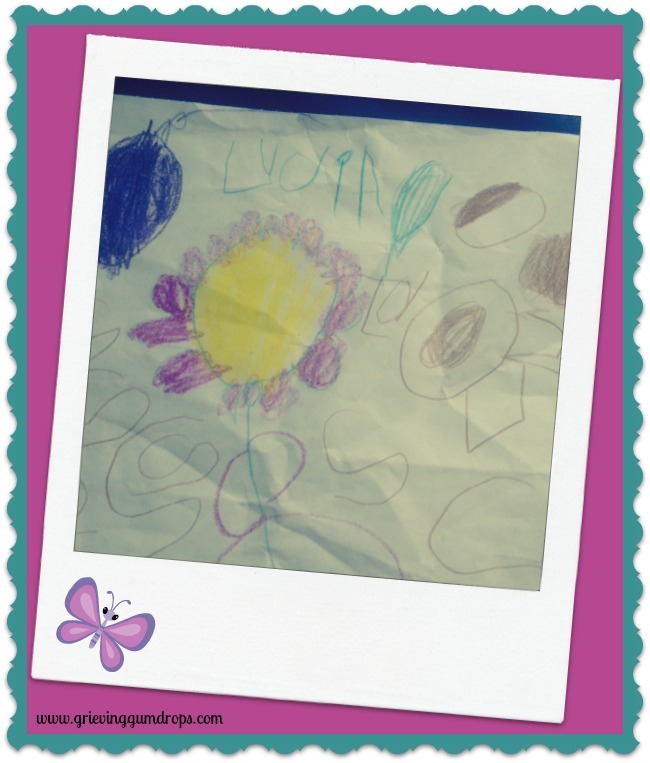 For today, here is a little Wednesday sunshine from Lydia..Love these little treasures I keep finding. More to come! Recently a little girl in our neighborhood died from brain cancer and I pray her family is receiving beautiful messages like these – what a special gift! Thank you for sharing Lydia’s pictures, I pray they will heal your heart. Oh so sad..I pray also that her family finds hidden treasures..I’m sure they will. They are absolutely very healing and warm my heart. Thank you for sharing.